Ever since I first accidentally discovered and booked budget room using Stayzilla (First review here) I haven’t had the need to look elsewhere. My stay in Mahabaleshwar, Kolkata, Yelagiri etc were booked through Stayzilla. As I realized that it is a Chennai based start-up that is growing fast, I approached them for an email interview, to understand the story behind StayZilla and their future plans. StayZilla team was happy to respond and quickly got me answers from the founder, Yogendra Vasupal or Yogi. I had 10 questions and below are Yogi’s answers to them. I believe these insights will be useful to travellers and others in the travel/hospitality industry, hence sharing them as a post. Q1: Tell us about the background story of Stayzilla. What prompted a venture in this segment of hotel bookings which is already crowded with other players? Why did you believe StayZilla will be a sure success? Yogendra Vasupal: I dropped out of college twice. First time I dropped out because I was making money online. Only after I dropped out I realised that college is a good alibi to spend quality time with friends. So I again joined the college and again dropped out in the final year. In the meantime, I was freelancing online, developing small websites, had 15 websites on my own and advertising income was coming. I was also an Amazon.com affiliate in 2002. By the final year at the college, I was earning Rs 1 lakh a month. But I realised that making money is not equal to creating value. That is when I called up our co-founders Sachit (Singhi) and Rupal (Yogendra). They, being from a business background, were in right from the first five minutes of our conversation. We looked at various business ideas, models and segments such as books because we were an Amazon.com affiliate. In fact, we also looked at diapers as a category. But we finally settled down with accommodation. Then we registered our company to bring accommodation service providers like hotels, lodges, guest houses or any other entity willing to provide the same as a short-term rental, online. Yogendra Vasupal: No, this has not happened as we ensure payment - typically last step is paying at the hotel before check-in. The feature is now 20% to book. Q3: Unlike airline seats, real time inventory management online is a challenge for hotel bookings. There is some offline work involved with most hotels, before we can be sure that rooms are available and booking. Do you see a solution to this in near future? Q4: One of the primary thing I look for in hotels in 24 hour check in check out faclity as against fixed 12 noon to 11 AM timings. But most hotels are not keen to provide this facility for better inventory management purposes. I like finding and booking such flexi timing (24 hours from check in time = 1 day) through stayzilla. I wish to know if other customers also demand 24 hour check in check out? Do you influence hotel management to change their policies based on customer demands and feedbacks? Yogendra Vasupal: We are the hotel's source of information from the demand side and we take inputs from this to them, so, yes. For eg, Pay At Hotel came from market and is now successful feature. Q5: Zomato does physical verification of restaurants every 3-4 months. Does Stayzilla perform physical verification of the properties listed? Yogendra Vasupal: Yes, more of a continuous process as opposed to once every quarter or so, since we act on the basis of continuous customer feedback. Q6: Does Stayzilla got plans to expand into more categories- such as bus/air tickets, taxi, holidays etc so that customers can book end to end or do you plan to stay focused on accommodation? Yogendra Vasupal: We do intend to stay focused on stays. Q7: I still do not see a provision for customers to provide a rating/feedback of hotels they have booked and stayed. Should we be expecting this feature soon? Q8: What % of bookings are happening via Mobile App at present? Are you betting big on mobiles likes everyone else? Yogendra Vasupal: We've gone with a seller focused approach and launched an app for structured stay first. We also have an m-site where we get 30% of our bookings from. Yogendra Vasupal: We have 460 team members, split between Chennai and Bangalore. We have a marketplace team in other cities that focuses on ramping up our supply on the alternate accommodation side. 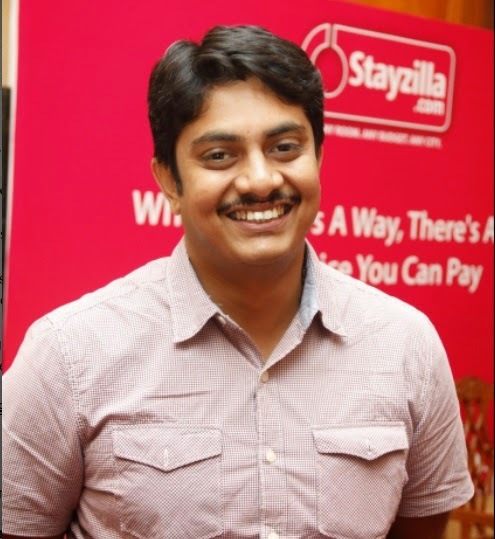 Brief Profile: Yogendra Vasupal is the Founder and CEO of Stayzilla.com and is fondly referred to as Yogi. While Yogi enjoyed a good academic track record, he chose to drop out of engineering midway from the prestigious Anna University, to launch his career at the early age of 19. His early years saw him undertake multiple freelance projects to develop web-based applications and ecommerce portals. Concluding remarks: StayZilla doesn’t plan to introduce a review/rating mechanism right away. I thought it will be useful feature, but it appears they waiting for certain volume of bookings, so that an overall fair review/rating can be shown, instead of one or two reviews which could be at extreme. But based on customer’s feedback, they do visit the properties or cross check information provided by hotel/home stay owners to ensure that negative things if any are taken care off. Another good thing to know is that StayZilla wishes to stay focued on Stay and not venture into other departments like tickets, holiday packages etc. Some companies do that as a way to grow, but if done prematurely, it takes focus off primary competency. Q2. Says everyone wants 100% payment, in my view it is wrong. Booking.com or agoda.com etc. will not take money for booking only some hotes take 1 day amounts just 3 days before we arrive ,even if we book for a 4 days if do not turnup then we will loose 1 day rent and it will be deducted from credit card. I booked through stayzilla last year for Mercera homestay hotel , yes they take 10% and rest of the % will come very fast and we need to make payments immediately.